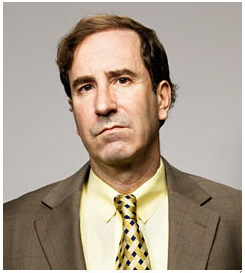 Harry Markopolos, born October 22, 1956, is a former securities industry executive and an independent forensic accounting and financial fraud investigator. Markopolos discovered evidence over nine years suggesting that Bernard Madoff's wealth management business was actually a massive Ponzi scheme. Beginning in 2000, Markopolos alerted the U.S. Securities and Exchange Commission (SEC) of this formally more than once, but the SEC did not uncover the scheme. Madoff was finally uncovered as a fraud in December 2008, when his sons contacted the Federal Bureau of Investigation. After admitting to operating the largest Ponzi scheme in history, Madoff was sentenced in 2009 to 150 years in prison. In 2010, Markopolos's book on uncovering the Madoff fraud was published, titled No One Would Listen: A True Financial Thriller. Markopolos has been scathing in his criticism of the SEC for both failing to discover the Madoff fraud despite repeated tips, and for failing to investigate properly the larger companies it supervised. He described the private moments he had with victims of the Madoff fraud as: "Heartfelt, gut-wrenching things. People trying to commit suicide or losing loved ones who’ve died of heartbreak." Markopolos graduated from Cathedral Preparatory School in Erie, Pennsylvania, in 1974. He received an undergraduate degree in Business Administration from Loyola College in Maryland in 1981, and a Master of Science in Finance from Boston College in 1997. Markopolos began his career on Wall Street in 1987 as a broker with Makefield Securities, a small Erie-based brokerage owned partly by his father. During 1988, he obtained a job with Darien Capital Management in Darien, Connecticut, as an assistant portfolio manager. From 1991–2004, he served as a portfolio manager at Boston-based options trading company Rampart Investment Management, ultimately becoming its chief investment officer. He is a Chartered Financial Analyst (CFA), and a Certified Fraud Examiner (CFE). Markopolos is a past president of Boston Security Analysts Society Inc. On February 11, 2009, the Boston Security Analysts Society honored him with a silver whistle in recognition of his efforts to expose Madoff. He now works as a forensic accounting analyst for attorneys who sue companies under the False Claims Act and other laws, emphasizing tips that result in continuing investigations into medical billing, Internal Revenue Service, and U.S. Department of Defense frauds, in which a "whistleblower" would be compensated.